You've probably heard about the Spektrum and Futaba FASST 2.4 GHz radio systems...these new systems are the latest craze in R/C! Well there is another manufacturer you may or may not have heard about...they are Xtreme Power Systems and their version of the 2.4 GHz radio is the XtremeLink system. Xtreme Power Systems is a company based out of Lake Havasu City, AZ. The company was formed on January 1st, 2006. Their products are developed in-house by electronic and software engineers having more than 30 years of experience. These same engineers also happen to be R/C pilots and drivers. We do all of our R&D and manufacturing in Lake Havasu City, Arizona (our plastic cases are manufactured in Taiwan). The product that we sell to the boat guys is the same product we use in our 200mph jet turbines. The XtremeLink product is true bi-directional and will allow us to send back telemetry data in the near future. You will be able to send back parameters like RPM, EGT and battery voltage. We have many hours on the water with our system. Many of the top drivers in the country are now using XPS. We also have a limited life time warranty on XtremeLink. If the customer has a problem they can send it back and we will repair it or send them a new unit. After contacting XPS about their system and informing them of the radio I was currently using for running my boats (JR-R1 pistol grip radio) they informed me that they had a module and receiver kit available for my radio. As a matter of fact they have modules for just about every radio on the market today! I received the kit from them shortly after and was anxious to go out and try it! The receiver and module kit was delivered with a quickstart guide that made the installation and setup a breeze. The kit included an 8 channel receiver and of course the module to replace the existing PCM module I was using. I will not get into the details of setting up the radio, since it is all very well explained in the Quickstart guide and the manual, but I will tell you that it only takes a few minutes! It is just about as simple as replacing the module in your transmitter and installing the receiver in your boat. Within a few pushes of the programming buttons on the transmitter module and receiver, you are ready to go! The instructions call for the antenna portion of the receiver to be mounted no less than 2 inches from any metallic object. This includes metal, carbon fiber, wires, servos, batteries, etc. In most cases this will be a problem in our R/C boats. The radio boxes are usually very compact and will make it very difficult to get a true 2" of clearance from any metal object to the receiver antenna. Knowing this, I put the receiver wherever I could fit it, which was where my PCM receiver was previously installed. The actual clearance between the antenna and all other metal object (including the tuned pipe) was 1 inch. I could have made a separate watertight box for the receiver only and mount it somewhere else in the boat, but I wanted to put this system to a test which would accurately represent the kind of situation most boaters would be confronted with. Installation is critical to all 2.4 GHz systems. The most important thing is to make sure that no servo or power wires come into contact with the antenna. *note: the small antenna you see sticking out of the foam in the top lefthand side of the pictures below is the actual receiver antenna. Although the wire from the voltwatch seems to be close to the antenna, it is well over an inch away. The single most important thing is POWER to the receiver! XPS recommend a good 5 cell Nimh, 7.4V 2 cell Lipo or a two cell A123 battery. The receivers can handle up to 30 volts. "We see many problems with voltage regulators, switches and battery packs that are "spot welded" . We like to use batteries that are soldered instead of spot welded. Always check batteries under load before using. Don't be afraid the charge after each race. After physically installing the receiver in the boat and the module in the radio, you must "bind" the receiver to the transmitter. This is a quick and simple procedure outlined in the quickstart guide. Once done, I fully charged my batteries and headed to the lake. Note: when using the XtremeLink transmitter, the antenna on your transmitter should be removed. The antenna on the Xtremelink module is used instead. Always set the fail safes! (yes this system DOES feature a failsafe! See below for more information) This can be done with or without the XDP programmer. The XDP programmer is a great tool from XPS that makes it very easy to program the receiver, but it is also quite easy to do without the programmer by following the instructions in the manual. (The tri-color LED on the receiver and the different flashing sequences really help in this process. The folks at XPS did an awesome job of this.) Set the fail-safe setting to "user defined" for the desired channels. Once the radio is installed in the boat follow the instruction manual on how to set the fail safes. My testing was quite simple. I ran several laps with one other boat in the water at the same time. We basically ran a few fun races coming in once in a while to refuel and inspect the radio box for condensation making sure everything was alright. Since we run on a small bay of an open lake, we have a lot of space for testing the range of our radios. I did several runs deep in the bay (much further than you would go in normal racing conditions) to see if I would get glitches or interference and the system showed no bad signs whatsoever. I have also run the boat with the XPS several times since my initial testing and have encountered no problems at all. The system also has a lot of neat features including programmable failsafe (as previously mentionned) for every output channel (going to servos), channel mapping and power level adjustments. Set Power Level: the output power level can be adjusted within a range of 1 to 5. For example, acceptable levels in North America, Australia and the U.K. are 1-5. For Japan and France the acceptable level is 1 only. Acceptable levels in Europe vary so with this system you can program the power level of the transmitter to be within legal limits dictated by law wherever you run throughout the world! Default setting is 5. Set Channel Mapping: this function can be used to assign channels to different output pins. The default channel map is 1:1. So for example, since I was using a JR radio and the throttle is on channel 2 for JR, then pin out number 2 on the receiver goes to my throttle servo. If I wanted to change it, I could remap 2 to output on pin out 4 on the receiver and plug my throttle servo on pin out 4 instead. Another interesting feature in channel mapping is that you can actually assign more than one output to the transmitter's channels. For example: assuming I wanted 2 throttle servos doing the exact same thing simultaneously, I could remap channel 2 from the transmitter to output on both channels 2 and 8 on the receiver (assuming you have an 8 or 10 channel receiver). Plug in one servo on pin out 2 and the second servo on pin out 8 and both servos would be responding to throttle inputs on the transmitter simultaneously! Not necessarily something that we commonly would require with boats, but nonetheless a nice feature to know is available. This could actually come in handy on some dual engine setups where throttle linkages can be complicated. Set Country: this function is to meet various FCC, ETSI, IC and other guidelines. All countries except France use setting 1 and France uses setting 2. Default setting is 1. Set Failsafe Map: this setting is to set the failsafe behaviour for all channels. Available settings are HOLD or USER DEFINED POSITION. In HOLD mode, the channel will hold the last position upon failsafe activation (for example loss of signal or invalid data received from the transmitter). In the USER DEFINED POSITION mode, the channel will revert to a position set by you during the setup of the radio. This procedure is explained in section 4 of the manual. Set Failsafe Time: This is a function that is lacking on many failsafe systems. There is nothing more frustrating than having your boat shut off during a race or in the middle of the lake because of a small glitch. Many failsafes react fast enough to do this and is the primary reason many racers do not use this function with their radios. The XtremeLink system however allows you to program the failsafe delay for a range of 1 to 5 seconds. This means that if you set this to 3, the receiver will have to register invalid data for a period of 3 seconds before applying the failsafe mode. This is a very good feature to have and I am very happy to see this offered with the Xtremelink system. As with any radio system it is important to always range check your system before operating your model. This procedure is clearly outlined in the manual. The manual is very thorough and explains in details the procedures to program your XPS system. The manual as well as much other supporting documentation can be downloaded directly from the XPS website. I absolutely love this radio system! I have been considering upgrading to a 2.4 GHz system but was a little reluctant due to the fact that I had not found one that featured a programmable failsafe. There were other factors, but this was my main concern as I like to know what my boat will do in case of loss of signal. Holding the last known settings and running into the bank at 60+ mph just isn't an option I want to live with if I can avoid it. The fact that this system has a programmable failsafe for every channel with the addition of a programmable failsafe delay made it VERY appealing. The system proved to perform flawlessly during my testing despite the fact that the positioning of the receiver was not optimal. On top of being an excellent system practically immune to interference, probably the greatest thing about the Xtremelink system is that you can now forget about waiting for your radio clip at the races...you just have to love that! If you are a racer you know what I'm talking about! To top it all off, the system is made in the USA! The pricing of the XPS system is also quite competitive. There is a small comparison chart, which can be found on their website, so you can compare the different 2.4GHz systems available. I would also like to note that the XPS website is well laid out and contains huge amounts of information on their product line. To anyone wanting to move up to a 2.4GHz system, I would seriously recommend looking into the XtremeLink system. Contact information is listed at the bottom of this page. Now granted I'm as new as you can get to rc boating, however not new to rc, and I just purchased the 3PKS because I wanted 2.4 GHz and one remote for my boat and monster truck. 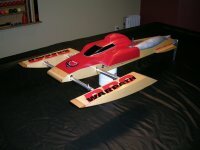 From what I have read on this forum and Jim's rc boat dock, I was under the impression that most guys were running the fasst system and not the spektrum because it posed problems. Now I haven't tested my range yet, but have had great success with this radio. Now that I've had the time to read through the manual properly I'm going to activate the fail safe that's build in. It has both a fail safe for loss of transmission, and loss of power from the receiver battery pack. Granted I'm only a sport boater and not a racer, and I supposed your saying you get better response time with the XPS. I just wanted to say I haven't had any problems yet with the fasst system, and I will be sure to post them if I do. There chart on our website is 100% accurate and will not change. You might notice that the chart refers to AIR systems, not surface systems. We know there are a lot more wins out there, so please share with us your victory info! We will be setting up individual pages on our website for pilots/drivers so you can share pictures and information. I could not agree more with Marc. I have read all of the stuff on those other boards and I will not comment on that either. I will comment on my experience and let you know the guys at XPS are extremely helpful and that I have been using the system for a couple of months now and have not had one problem. If I would have read what was being said about them on other boards before I bought there system I probably would not have purchased it and that would have been a mistake as I love the system. Brent Daily from Propworks West told me about the system and how much more responsive it was then the system he was using and I still waited over a year before I tried it to make sure he would have no problems and he never has. If you are interested in this system I would suggest calling the guys at XPS and talking with them about any concerns you might have. No worries. XPS has been made aware of the errors, nearly a year ago, but have decided for whatever reason not to correct the chart. Not trying to step on toes, just make people aware that there is a lot on information to be had on this system. Absolutely, the chart in the article was taken from the XPS website...never said otherwise. If their are errors thank you for pointing them out. As for what the folks over on other sites are saying about the system...I read some of it...I don't want to comment on it...I stand by my opinion based on my own personal results and those people I can trust who are using the system also. To this date we have had excellent results with the XPS system. Hard to say otherwise when that's your own personal results...others might say otherwise, but I will not change my opinion based on others'.